- #1 UMass (28-8-0, 18-6-0 HEA) returns to the Hockey East semifinals for the first time since 2007 and the first time as the number one seed. - The Minutemen have only appeared in the semifinals three times, facing New Hampshire on each occasion. They advanced past the Wildcats in 2004 for their first and only trip to the Hockey East Championship game, where they fell to Maine, 2-1, in triple overtime. - #7 Boston College (13-21-3, 10-11-3 HEA) enters the TD Garden for its fourth straight appearance in the semifinals, and will look to return to the championship game for the first time since 2017, a 4-3 loss to UMass Lowell. - This weekend marks the 25th time that the Eagles have advanced to the final four of the Hockey East Tournament. They have posted a 17-7-0 record through their first 24 appearances and have gone on to capture the Hockey East tournament title a league leading 11 times, including nine under current head coach Jerry York. - Friday night marks the first meeting at this stage of the tournament for the Minutemen and Eagles. Boston College holds the advantage with an 8-1-0 all-time record in tournament play over the Minutemen. UMass' lone win came in the opening round of the 1995 tournament, while the Eagles have swept four quarterfinal series. - UMass sophomore defenseman Cale Makar (Calgary, Alta.) was named as a Top 10 Finalist for the 2019 Hobey Baker Memorial Award on Wednesday. He is the lone representative from Hockey East in that field, one that includes six defensemen. - #3 Northeastern (25-10-1, 15-8-1 HEA) takes on #5 Boston University (16-17-4, 12-9-3 HEA) in the semifinal round of the Hockey East Tournament for just the second time in league history. Their first meeting came in the form of a 5-2 Terriers' victory back in 1994. - The Huskies are 2-8-0 in semifinal appearances and have captured the tournament title in each of their two appearances in the title game. Their most recent championship win came in 2016, 28 years after their first win in 1988. - The reigning Hockey East Tournament champion Terriers return to the semifinals for the third straight season after defeating UMass Lowell in the best-of-three quarterfinal round. - Boston University is tied with Boston College for most appearances in final four of the Hockey East tournament with 25. The Terriers are 12-12-0 in the semifinals and have gone on to capture nine tournament crowns. Their most recent came in a 2-0 shut out over Providence last year to earn an automatic bid into the NCAA Tournament. - With a win on Friday night, Boston College head coach Jerry York will become the all-time winningest coach in the Hockey East Tournament with 63 wins. He is currently tied with long-time rival and Boston University bench boss, Jack Parker. 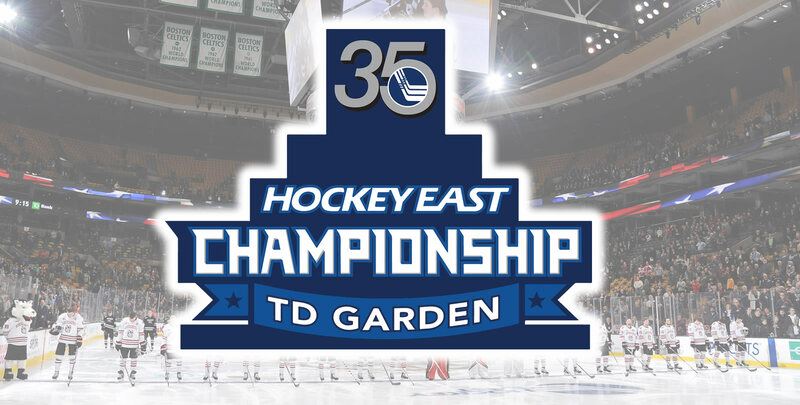 - This year's Hockey East semifinals feature the first, third, fifth, and seventh seeds, the first time that combination of seeds has advanced to the semifinal round of the Hockey East Tournament. - The lowest seed to ever claim the Hockey East Tournament crown came in 2016 when Northeastern won the Lamoriello Trophy as the sixth seed. - Albie O'Connell is just the first first-year head coach in 22 years to lead his team to the Hockey East Semifinals at the TD Garden, the last time coming when Tim Whitehead brought the UMass Lowell River Hawks to Boston in his first season with the program in 1997. A first-year head coach has never claimed the Hockey East Tournament title. - Boston College and Boston University are both making their league-record 25th appearance in the tournament semifinals. - The top seed has won the Hockey East Tournament 17 times, most recently in 2017 when UMass Lowell downed Boston College in the championship game. Meanwhile, the third seed has just three titles, the last in 1999, while the five seed has never won the Hockey East Tournament. - The 2019 NCAA Tournament Selection Show will take place on Sunday, March 24 at 7pm on ESPNU.